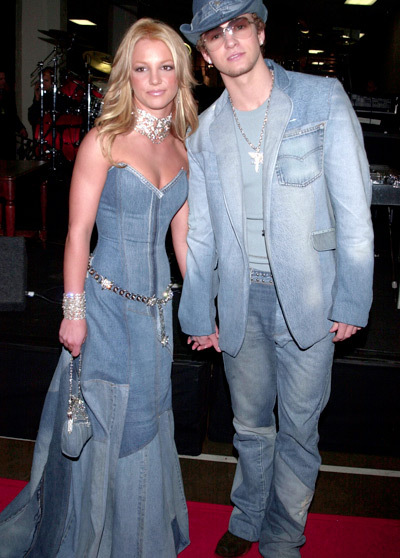 If you were old enough to remember that late-90s/early-2000s and their pop rivalries (Britney Spears vs. Christina Aguilera/Nsync vs. Backstreet Boys), then you probably remember the golden couple of their time: Justin Timberlake and Britney Spears. Because social media was not a thing on which our faves embarrassed themselves back then, fans truly savored every bit of photo evidence, every interview quote and every rumor we heard in an attempt to form a full picture of our favorite stars. And while things did not end amicably between Justin and Britney ("Cry Me a River" was reportedly written about Britney. Ouch. ), things once were great. In an interview from 2000 that many fans probably haven't seen before, Britney talks about how the two started dating. While they did meet on the Mickey Mouse Club, they lost touch for a few years until ultimately bumping into each other again. She said, "We saw each other again…at a radio show and he came backstage and I was there. And he knocked on my door and we saw each other and ever since then we’ve been going out…you get butterflies in your stomach." It's super cute to see 2000s-era Britney, super happy and clearly head-over-heels for Justin. And while their love may not have lasted forever, at least we'll always have this photo. Check out the video above to see the full interview! And while you're at it, be sure to stick around to the 30:10 mark when Britney admits to nearly going out with Prince William. Spoiler alert: She didn't. See Yearbook Photos of Britney Spears, Justin Timberlake + More Celebs!